For an introduction, Marathon, like many of the Lower, Middle and Upper Keys communities, bears a railroad name. Therefore, before about 1908 the area existed under some other name. No doubt it had a location name used by the early Native Americans. I have no knowledge of this. Secondly, it appears to have simply been "Key Vaca," the name given to it by Spanish cartographers, and used by groups of fishermen from Mystic, Conn. This group soon centralized their operation at Key West. Thirdly and around 1818, a settlement known as "Port Monroe" was founded by what may have been the first Keys developers (other than the Native Americans). There are records of John Fiveash and Joshua Appleby placing newspaper articles advertising a "large and spacious harbor" and a location for "provisions of all kinds." This was short lived as the commander of the new anti-piracy squadron at Key West and arrested Appleby. The charges did not stick, but more of less Port Monroe as a community was doomed. The fourth name associated was "Conchtown" and somewhat justified by the 1850 census which shows almost all the adults as Bahamians. Included were wreckers, primarily those lead by William Bethel, and Bahamian fisherman occupied the eastern end of Key Vaca. The Richard Russell and Temple Pent family were two of them. More details follow. 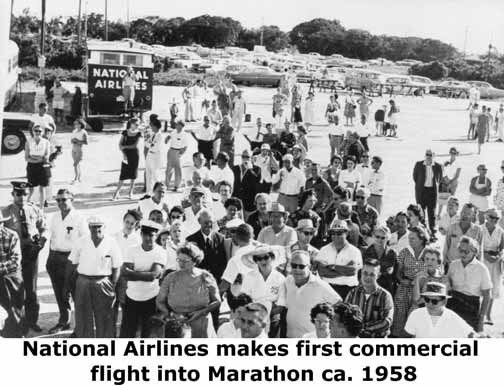 Marathon began in historical times as Cayo de Bacas or Vacas. Vaca is Spanish for "cow" and general knowledge is that there were no cows (bovines) on Key Vaca in early times. In Spanish "Vaca Marina" is the manatee or sea cow. This is my preference. However, Bill Ackerman wrote in his 1957 book The Florida Keys, "Key Vaca, or Cow Island, was so named for the Spanish cattle that once roamed here in a near-wild state." Often when names appear in their plural form it includes a closely grouped set of smaller islands. Narvaez in 1528. His maternal ancestry was given the name 'Cabeza de Vaca' for guiding an army against the Moors through a pass marked with the skull of a cow in 1212. In Spanish, 'Vaca' symbolized victory against great odds and was proudly borne. Others say the name was after the sea cow. The names of many of the Keys can be the subject of discussion. A U. S. Coast & Geodetic Survey letter for project HT 156 (1935-1936) discusses many names. Page 2 of Sheet No. 17 reads "Knight Key: The Key was named after the original settler and is locally called Knights Key." Page 2 0f Sheet No. 15 Grassy Key: "Local information states that the Key was named after an old settler and not because it was partially covered with grass." A note is that Grassy Key had that name in a 1855 wrecker's court record for the burning of the shipConcordia. Page No. 3 concerning Key Vacas gives the pros and cons of using the final "s". In the Upper Keys, probably the oldest continuous family is the Russell family. They are descendants of Richard and Mary Ann Russell who arrived on Key Vaca around 1838. In 1854 they moved from Key Vaca to Upper Matecumbe Key. A February 10, 1823 "Notice to Mariners" was printed in The Floridian of Pensacola "Ship News" advising the public of the settlement of Port Monroe, Key Vaca. It was probably on Knight's Key as the notice stated that fresh water is available five miles away. Among other things the notice said, "At present there are four families residing at this place; corn, potatoes, beans, onions, cotton, and all West Indies fruit thrives rapidly, and surpasses our most sanguine expectations. JOSHUA A. APPLEBY, JOHN W. FIVEASH." The above two men were apparently involved in some shady maritime activities. Shortly after Florida became a U.S. Territory in 1821, Port Monroe attracted the attention of Commodore David Porter and his U.S. anti-pirate squadron. Porter sent Lt. Rogers and six marines to maintain the law. A 1825 congressional law mandated that all wrecked property be taken to American ports-of-entry (Key West and St. Augustine). This, in addition to the law enforcement actions taken by Commodore Porter, just about doomed Port Monroe. Joshua Appleby formed a partnership with a Solomon Snyder and they hired Silas Fletcher in 1824 to construct and operate a store for mariners on Indian Key. It is said that Temple Pent Sr. was Key Vaca's first permanent European settler and was the beginning of the settlement called Conch Town (presently the area of 109th and 112th streets). He had lived on Key Biscayne from 1810 to 1825, then in Key West until 1836, when he moved to Key Vaca. He had married Mary Kemp. He served as a ship's pilot for Commodore David Porter and was one of the first licensed maritime pilots in Monroe County. He probably selected Key Vaca because of the Indian violence in the Key Biscayne area. Capt. Pent 11th child, a son named John, was born in November 1839 could have been the first white person born on Key Vaca. His first son, Temple Pent Jr. could have been Key Vaca's first marriage when he married Eliza Bulward in 1840. There are reports of shipbuilding on Key Vaca. The Pents were listed as mariners and Edmund Beaseley as a carpenter. Two ships were constructed on Key Vaca -- the 13-ton schooner Laving and the 9-ton schooner Jane Ann in 1840 and 1841 respectively. During the wrecking period, I found three other ships specifically listed with home ports of Key Vaca. These are the schooner Amelia, Captain Joseph Bethel, 1835; the schooner Single Sailor, Captain R. Roberts, 1835, and the sloop Vevilia, Captain Wood, 1840. John Lee William's wrote in his (1837) The Territory of Florida, page 37: "The Vacas or Cow Keys are ten or twelve in number, and extend about 15 miles in length. Some of them are four miles in length, while others are scarcely half a mile long; some are covered with tall pines, some with hammock trees, and some almost entirely with grass. On the north side of the group they are generally rocky, and bear many small palmetto trees. There are from 10 to 15 families scattered over them. Knight's Key, the southwest key of this cluster, has a good house and cleared field, that appears to great advantage from the water. Most of these keys possess good springs and wells of fresh water, and turtles are abundant in the neighborhood." Dr. Perrine wrote in 1840 that there were about 200 settlers on Key Vaca. This would make Key Vaca more populated than Indian Key. Of course, it is also many times larger in size. It appears that Perrine was relying on those settlers to help propagate his agricultural experiments. Public records are a little confusing, but it appears that the General Land Office on September 12, 1845 declared the Marathon area (and much of the other Keys) as a Military Reservation. It was not released until 1878. During this later time was when the settlement of 'Conch Town' was reported by passersby. It appears to have been on the northeast end of Key Vaca. Of interest are excerpts from the Charleston Daily Courier dated January 10, 1858 of a voyage made to Knight's Key with Charles Howe: "...Commenced with Knight's Key, containing about one hundred and twenty-five acres of arable [plowable] land, and has a comfortable house and cistern. On this Key we have twelve hundred cocoanut trees and about fifty thousand Sisal hemp plants, most of which are fit to cut and manufacture into hemp...." They sailed on "...Passed Duck Key, where much money was expended on forming a salt pond...."
The Dade County Census of 1860 reveals Temple Pent Sr. (Mariner), wife Mary and sons John and David living on Key Vaca. Their elder son, Temple Pent Jr., wife Elizabeth and three children were also on the island. There were a total of six families listed and five bore the name Pent. The sixth family was John and Amelia (Pent) Skelton, who had five children. The total 1860 population of Key Vaca was reported as 26 residents. Legend has it that shortly after May, 1865, Judah Benjamin rendezvoused with a ship in the harbor of Knight's Key to complete his escape to Bimini. Benjamin was the "retiring" Secretary of State in the Confederate cabinet. Using multiple disguises, he traversed the mainland of Florida and stopped over at Knight's Key on the 16-foot yawl The Blonde. A U.S. census from the Act of 1866 revealed a complete depopulation of Key Vaca for reasons yet to be determined. Population zero. Everyone had moved away! The Pents went to Bamboo Key, the Russell's to Matecumbe, Beaseley to Coconut Grove, et cetera. Bamboo Key is north of Fat Deer Key and was reported to have had no mosquitoes. My standard reference census of 1870 also listed no one on Key Vaca and Temple Pent Jr. and 15 members of the Pent family on Bamboo Key. Key Vaca remained almost uninhabited for years. Published in 1890, A Handbook of Florida by Charles Norton noted the community of "Conch Town" on the bay side of the east end of Key Vaca. In 1893, George Adderly and his wife Olivia moved from Upper Matecumbe Key to Key Vaca and built a home of "tabby concrete." Tabby is a mixture of sand, gravel and lime and often was used as a mortar to hold rocks together for making a concrete wall, pier, etc. The difference was, instead of purchasing lime, they made their lime by burning and grinding seashells to produce homemade lime. The next significant event for Key Vaca was Flagler beginning his construction of the Overseas Railroad. Key West was the primary goal; Knight's Key the secondary. From docks on Knight's Key, Flagler operated his Peninsular and Occidental (P & O) Steamship Company to and from Havana while awaiting the completion of the railroad to Key West. The standard story for the derivation of the name Marathon has many variations, but most have to do with the speeding up of the railroad construction work, or its long duration of completion. The popular exclamation was, "What is this, a marathon?," or "This is getting to be a real marathon!" The marathon was of course the unrelenting, day and night struggle to complete the railroad to Key West. In the Marathon area there were actually three railroad stations listed in the January 7, 1908 train timetable: Vaca, Knight's Key and Knight's Key Dock. Nine months later, the October 1, 1908 timetable listed the station as "Marathon," instead of Knight's Key Station. Carlton Corliss, formerly of the F.E.C., wrote "Knights Key station was simply renamed Marathon." As with most of the Keys communities, the railroad station's name established the name the community retained. Three months later, the Marathon post office was established which further established the use of the name. An October 9, 1908 newspaper clipping in the Flagler Museum (no source indicated) reads as follows: "The extension [water] well on Key Vaca which has been in the charge of Mr. Ed Sheran has finally been abandoned after reaching a depth of 680 feet. The machinery has all been removed to a new location on Knight's Key where a final effort will be made to locate water. A large two-story fish house is just being finished at Marathon, Key Vaca on the Extension Railway. 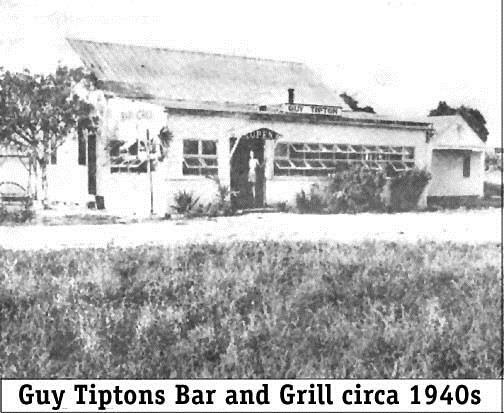 It is being erected by Mr. R. McCreary of Tarpon Springs. The two-story, 25-room boarding house being built at Marathon by the F.E.C. Railway for its large force of employees will be completed shortly. 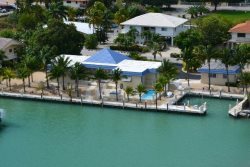 It has a beautiful location overlooking the Florida Bay. Mr. T. C. Ese is foreman of the work." 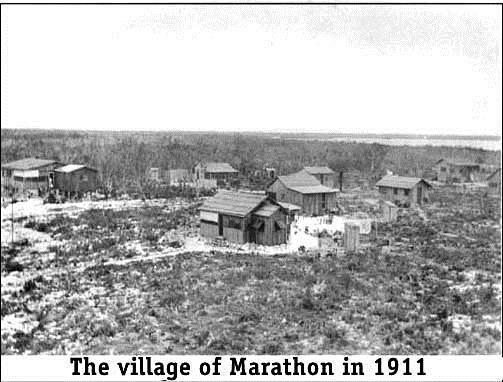 It is obvious that the name Marathon was well established and recognized by the media by the end of 1908. There was a post office established for Knight's Key on April 13, 1907 in anticipation of the arrival of the railroad; also for all the F.E.C. employees working for the huge railroad facility. The settlement of Marathon established its post office on February 23, 1909 and Knight's Key post office closed on January 30, 1912. 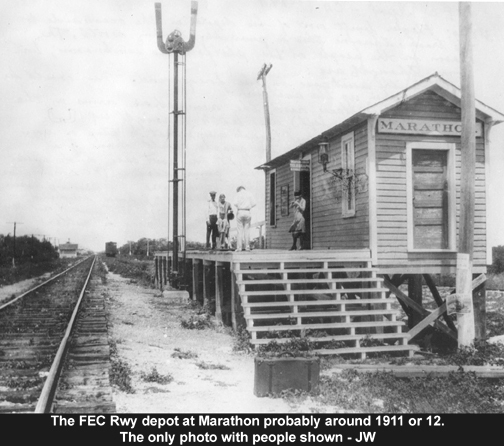 Marathon soon became a bustling railroad town connected by a series of boardwalks. For some reason the Marathon post office was closed and services moved to Pigeon Key on May 25, 1923. 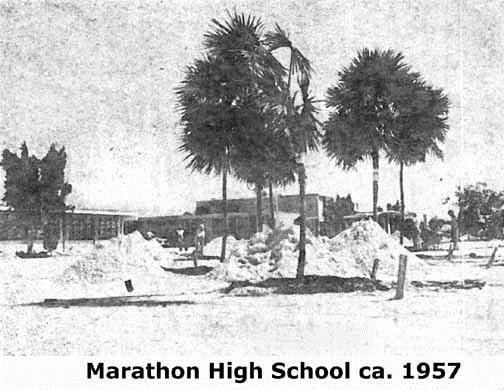 It was re-established at Marathon on March 9, 1927. Neighboring Pigeon Key, Cayo Paloma on Spanish charts, was a major stepping-stone for the railroad construction. 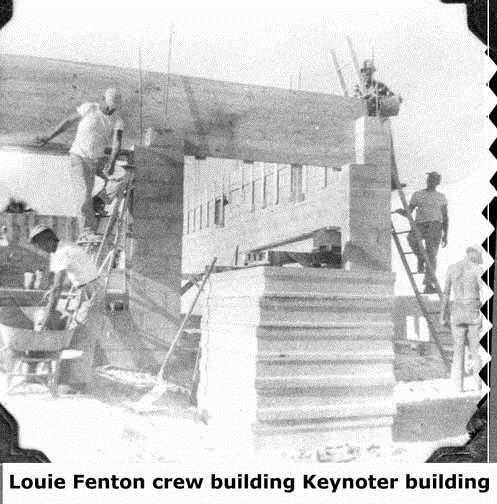 Like Long Key, Marathon and Bahia Honda, a major construction camp was built on Pigeon Key. It survived as the Overseas Road and Toll District base of operations. It is the only large collection of railroad buildings spanning these two eras that remains. See Pigeon Key page. 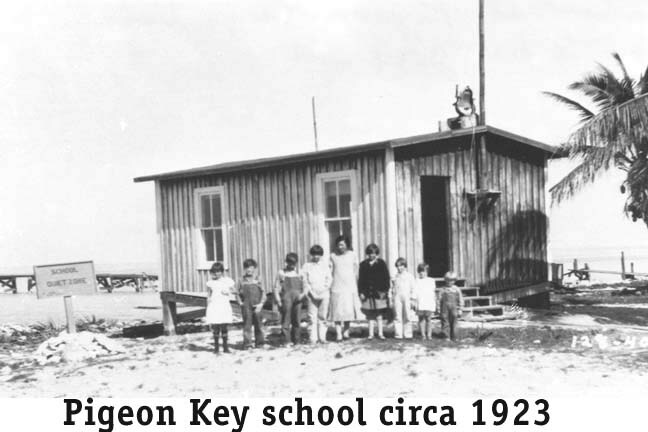 Marathon had a school as early as 1909, which was, as in the rest of the Keys, a one-room schoolhouse. Well known Upper Keys Charles "Prof" Albury taught school in Marathon in 1929 before moving to Matecumbe to teach with Ferran Pinder, and then to Tavernier after the 1935 hurricane. He retired in 1966 as the principal of Coral Shores High School. Marathon was not damaged significantly in the 1935 hurricane but there was a loss of life. From the Miami News dated September 6, 1935, "12 Dead Found at Marathon, Grassy Key By Rescue Craft - Six are dead at Marathon key, including Manager Lilja of the Thompson Fish Co. there, and six negroes are dead at Grassy Key. . . ." To read a government report of an inspection made on September 16, 1935. MonroeSue Moore followed "Prof" as teacher, but moved to Big Pine Key after the 1935 hurricane. County's school newsletter "Tropic Topics" states that in 1938, Sue Moore and Mr. Woodburn (the postmaster) of Marathon submitted a list of 15 students for a school at Marathon. One of the buildings owned by the Bridge District would be repaired and house the school. The School Board approved the proposal and requested that the Bridge District allow the school bus to pass through the tollgates without charge. When speaking of Marathon school history, one must mention Mrs. Eva McKinney. When school opened in September, 1947 there was no teacher. Mr. and Mrs. McKinney of New York City had purchased land in Marathon and hurried there to teach. She taught at the Sue Moore School for 18 years. Ground would not be broken for a high school until October 5, 1956. The Marathon High School opened the following year with Gerald Guthrie as principal. The high school PTA held its organizational meeting in May 1957 with Lillian Tingler nominated as president. The largest Keys Fish story took place in 1912 just off of Knight's Key. Captain Charles Thompson of Miami harpooned a 38-foot-long whale shark that reportedly took about 39 hours, five harpoons and more than 100 bullets to subdue. The 26,594-pound whale shark was towed to Miami, preserved, stuffed and exhibited on a railroad flat car. The sign on the flat car read "weight 30,000 lbs. Length 45 ft." All went well until it was accidentally destroyed by fire in 1922. One of the first, if not the first, fishing guides in Marathon was Captain Harry Snow. Harry came from New York as a railroad supervisor in 1926. He was a hard-hat diver performing underwater inspections of the railroad piers. That same year he caught his first bonefish. 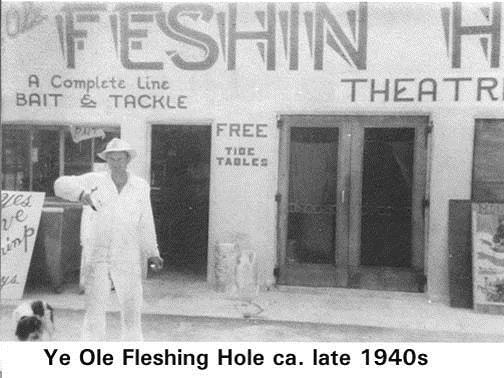 After the 1935 hurricane severely damaged the railroad, he became an inspector for the Overseas Road and Toll District from which he quit to become a full time "flats" fishing guide in the Middle Keys. 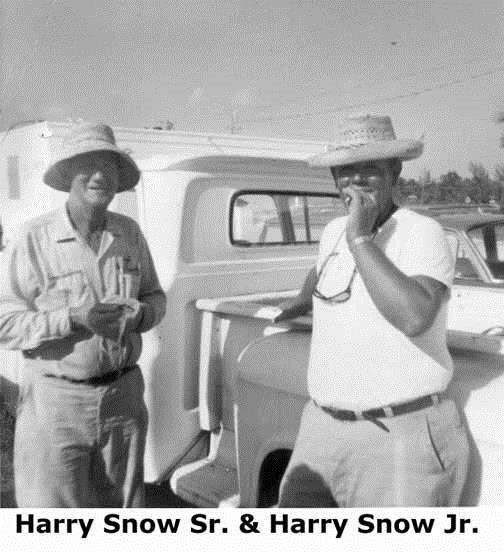 His son, Harry Snow Jr., followed in his footsteps as a fishing guide. Fishing was and is an important part of Keys living. William and Mary Parrish moved to Marathon in 1927 with five daughters and one son to operate a fish house. Captain Snow married one of the daughters. The Parrish family watched the town grow as the first Overseas Highway with ferries went into operation. The family was instrumental in re-opening the school in 1928 by inviting a teacher, Miss Tessie Kyle, to live in their home. 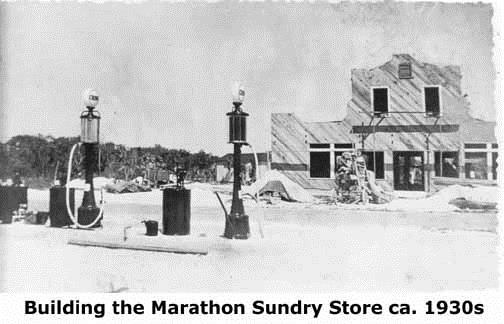 After the 1935 hurricane and the subsequent new highway opened, William Parrish became Marathon's first real estate broker. The highway also ushered in Greyhound Bus service (1938). One of the seldom mentioned, old time residents was Stephen C. Singleton. He homesteaded on Ramrod Key in the railroad days, sold real estate in the Upper Keys during the 'land boom', then managed the Key West Chamber of Commerce, but chose Marathon for his last days. The 1930s brought change to Marathon and it was change that stayed. The 1909 post office had gone through a few postmasters. 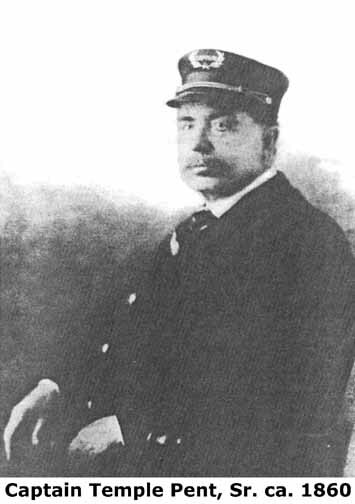 In September of 1929, Arthur Woodburn took over as postmaster, a position he held until retiring in 1948. His Marathon Boat Yard was the post office and his wife ran a grocery store. H.S. McKenzie came down from Tavernier to construct the Sundry Store. In 1937 Jodie and Lulu Hall started building Hall's Fishing Camp with overnight accommodations. A few more cabins were added each year. Soon William Thompson built his Marathon Yacht Basin. Marathon continued to grow slowly like the Keys other than Key West. For one reason there were fewer amenities - no electricity, few churches and no high school. 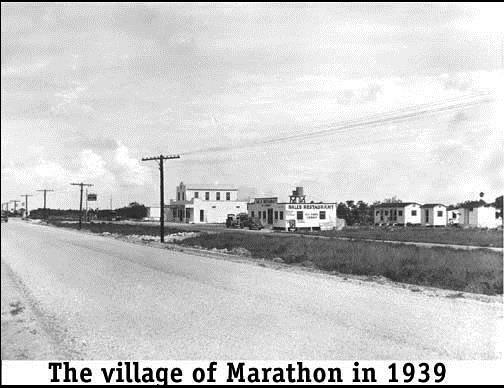 Here is a photo of Marathon around 1939. The large building is White's Sundry Store. The Toppinos opened the Overseas Lodge. Gilbert and Maud Spense opened the Flamingo Bar and Restaurant (1945). Next in time was World War II. Did World War II impede Marathon? The answer is generally no. The advent of World War II brought electricity and fresh water to all the Keys, but Marathon also gained an airport and a Coast Guard facility. 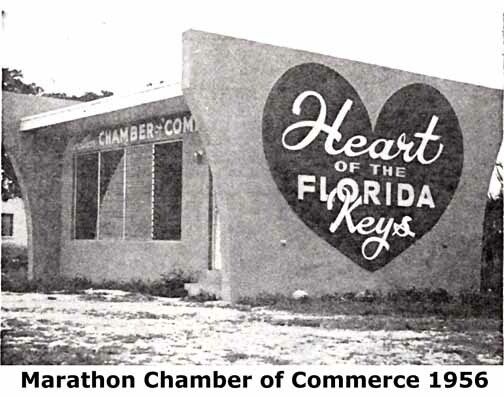 Florida Keys Electric Cooperative Association, Inc. (FKECA) was certified by the Florida Secretary of State on January 22, 1940 with an office address of the "Marathon Grocery, Marathon, Florida." It had its first board meeting four days later and John A. Russell of Islamorada was elected chairperson. Of the incorporators, one was from Stock Island, two from Marathon, one from Islamorada, two from Tavernier and three from Rock Harbor. Electricity led the way for John and Wilma Brantner to open 'Ye Old Feshing Hole', first a bait and tackle shop, eventually a theater and a meeting place for the Catholic Church. The Brantler's would leave cans of gas outside when closed using the honor system for payment. Marathon also had a Coast Guard recruit (boot) camp and a sizable Navy repair yard on Hog Key. Were fill lake Ostensibly as a training facility, the Army Air Corps built a 5,008 foot long airstrip during World War-II. 280 acres were purchased from Norberg Thompson and Maitland Adams and Belcher Oil Company of Miami constructed the facility. As the property was very low, fill from excavated creating today's Dodge Lake beginning in 1942. The extremely long runway indicates that the "training" involved aircraft up to and included heavy bombers. This is a natural conclusion since aircraft crew training involves many practice take-off and landings away from populated area and crowded operational airfields. No maintenance or support facilities were built, but most believe it was for more than an emergency/alternate landing strip. Some believe it had a secret mission, others say they did not want large bomb loads taking off from Key West. The construction of the airfield brought another early family to Marathon. Thelma and Byron (Parky) Parkhurst had been following construction work on government war contracts in Florida and moved to Marathon in 1943 as a truck driver for the airfield contractor. When the job was over, Parky bought the truck for use in local jobs. He soon found work as manager of the Overseas Lodge. In 1945, he purchased a 38-foot Mathews boat and converted it (The Bon-Ami) for off-shore fishing. Thelma worked as his mate and in 1948 became one of the few female boat 'captains' in Florida. It was time for Marathon to have an estate, or mansion, which ever word you prefer. Masonry construction was used in the Keys before the later 'big hurricanes.' Two large concrete houses were built on Key Largo in the 1920s and another one on today's Fiesta Key for L.E. Goetz. At Marathon, Harold Clark had developed the Sombrero Hotel in the 1930s, which was later rebuilt as the Buccaneer Resort. 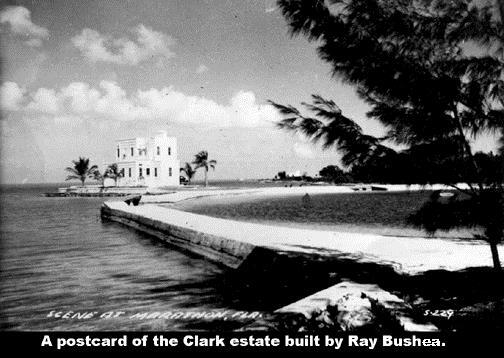 In the 1940s, Ray Bushea built Mr. Clark a very large masonary house on Florida Bay as shown on a postcard at the right. Harold Clark was from Chicago and was the inventor of the oil seal. After the war was over, local business individuals and groups sought to make use of this obvious community asset. The first commercial airlines to offer scheduled air service was National Airlines in 1958. A lighting system, rotating beacon and hard surfaced overlay were added in the 1960s. A parallel taxi strip was added in the 1970s. The facility has been completely modernized and is operated by the City of Marathon and Monroe County who after much effort hope have a successful scheduled air service. 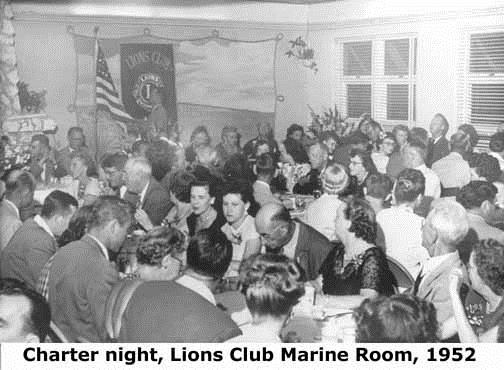 Like the rest of the Florida Keys, Marathon realized changes after World War II. There are too many to list, but I believe the arrival of Francis and Mary Crane deserves listing. The story should be well known. Simply, they purchased the Norberg Thompson, Maitland Adams and George Adderly land tracts. All in the 1950s, they built a house, a museum, gave land for a church, developed a sub-division. What remains today are Crane Point and Crane Hammock as testimony to early minimal environmental impact development. In the absence of city directories, telephone books give a glimpse of a community. In the November 8, 1951 edition there are three exchanges: Marathon, Matecumbe and Key Largo. Marathon has two pages with 149 entries including residential, business, the telephone company, Road and Toll District, Highway Patrol and US government. All are four digit numbers. In 1961 there are 10 pages all with the 743 prefix. Although all the Keys participated in the 1950 "dredge and fill" mode, the author believes that Marathon led the the way. The Chamber of Commerce under J. J. Hall, president; Fred Center, vice-president; and board members William Parrish, Sr., Deane Brigham, Lewis Gray, George Goodson and E. G. Stempel plus about 200 members provided guidance. One of the 50s structures that remains began as the Davis Docks project or the Marathon Motel and Docks. Floyd W. Davis had owned the property where Miami International Airport was built and established himself as Miami builder with projects in Liberty City area. 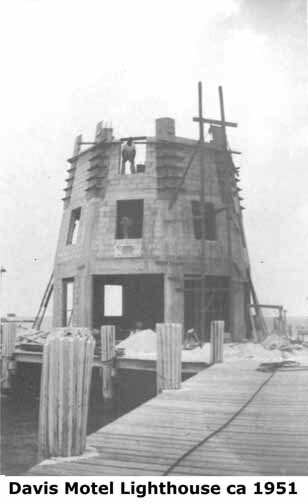 For his Marathon project he employed Tampa contractors Archie and Ollie Rackley to construct a lighthouse designed by Les Barett for the project's landmark structure. The exact date of opening is not known, but from advertisements it was in full operation in 1957. Then came Hurricane Donna and in 1967 Boca Grande residents Diane and Michael van Beuren completely renovated the Hurricane Donna damaged Davis project and renamed it Faro Blanco. Faro as an English name for lighthouses evolved from the 200s B.C. lighthouse Pharos of Alexandria. Another structure was the Marathon Theater, Marathon Self Storage. The theater had seating for 450 customers, quite an ambitious project for the time. I opened for the showing of the "Battle Circus" on July 19, 1953 starring Humphrey Bogart and June Allyson. In the 1950s, Phillip Sadowski and John Puto probably double-handedly had made the largest change by developing Marathon Shores and Little Venice areas. Their 125-unit air-conditioned Key Hotel changed ownership frequently. 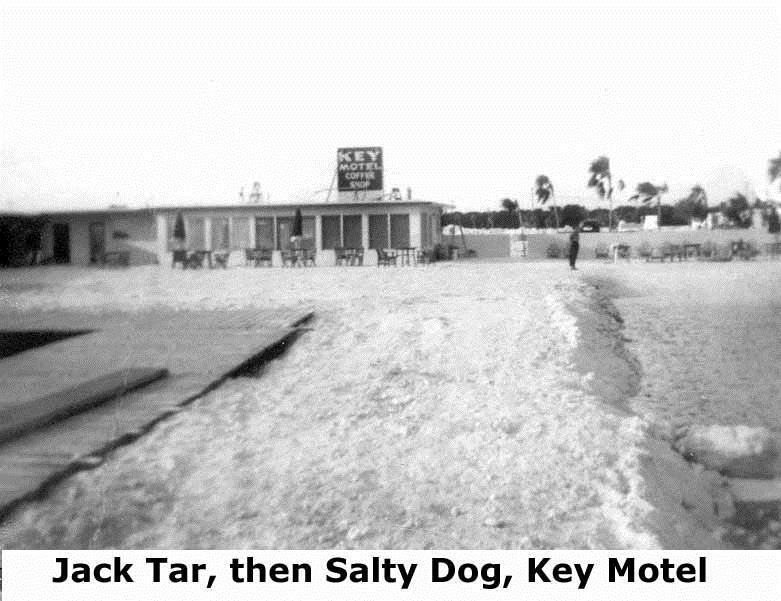 First the Jack Tar Motel, then the Salty Dog Motel, the Driftwood Inn, etc. 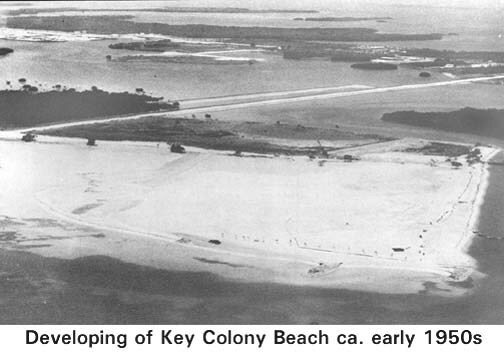 Almost at the same time, Shelter Key was developed into Key Colony Beach. Shelter Key was about 90 acres of mangrove in 1953 when Sadowski converted it to a 285 acre buildable island . With about 20 homes, the City of Key Colony incorporated in 1957, built a convention center (now the city hall) and has governed itself throughout these bureaucratic times. threat when they opened Stout's Restaurant in 1964. And sure enough it was Hurricane Betsy in September 1965, but Marathon was spared massive destruction this time. Betsy was followed by Hurricane Inez in October of the next year, however only minimal damage was done. Newcomers began to worry with six hurricanes in six years. As in much of the Keys, the 1970s were the "dredge and fill" era. Marathon began the decade by again declining to incorporate by 517 against and 115 for. The state designation of the Florida Keys as an Area of Critical State Concern in 1974 supplied the reins to be pulled on to control development. Government agencies began impact studies and environmentalists moved in. Most know the story from there on. Evolution occurred as in most communities. An example, with time Tiptons Bar and Grill changed to the Hurricane Lodge then to the Holiday Inn of Marathon. The 1980s were a time of continued change for now not-so-small Marathon. Probably the significant event was the highway modernization. Construction of a new Seven Mile Bridge began in 1979 and opened May 24, 1982. The Vaca Cut Bridge was next opening for two-way traffic in March 1983. Controversy surrounded the four-laning 'in town'. It was done in five segments beginning in March 1985. The southwest portion was not done. The impacts and results of growth came home to rest in the 1990s. There were many who followed the likes of the Pents, Moores, Singletons, Smiths, Snows and Parrishs. They ran the proverbial 'marathon' well and produced today's great Middle Keys community, which has just voted to incorporate. What will 2000 and beyond bring? Special Thanks to Jerry Wilkinson for that GREAT History Lesson!